AC Transit has invested the past two decades in building the most comprehensive fuel cell electric bus demonstration program in the United States, featuring a growing fleet of zero-emission buses, on-site hydrogen production and fueling, on-site fleet maintenance and ongoing independent performance evaluation of the fuel cell bus fleet. In fact, AC Transit currently operates a fleet of 13 third-generation fuel cell buses. Their fleet has not only traveled more than 2.8 million zero emission miles, but one of the original fuel cell power plants has logged over 30,000 hours of operation, substantially beyond the 4,000 hours originally specified by the fuel cell manufacturer. 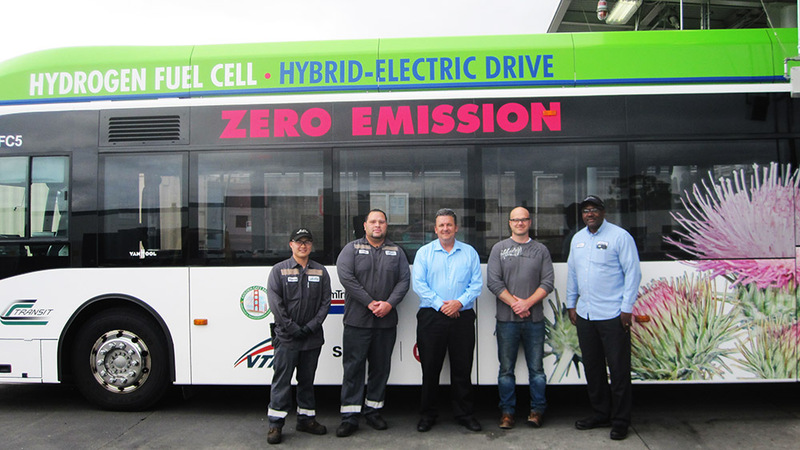 This unprecedented achievement is due in part to a first-of-its-kind training program that teaches their maintenance employees the advanced skills required to maintain this new zero-emission bus technology. By the spring of 2019, AC Transit will have 10 new fuel cell buses and 5 battery electric buses from New Flyer. These buses will be operating on the same routes, . offering a true side-by-side comparison of zero-emission bus technology. AC Transit is excited to be a world-recognized leader in addressing environmental concerns and continues to seek new and innovative methods of implementing clean zero-emission technology. AC Transit is one of three agencies in California activity engaged with fuel cell electric buses and hydrogen infrastructure. The other two are Sunline Transit and Orange County Transportation Authority. You can learn more about these buses by visiting https://cafcp.org/buses_trucks#buses_trucks_transit. We must move away from our dependency on fossil fuels. Diesel fuel is polluting our environment and we demonstrate daily that hydrogen fuel is a viable alternative option. Hydrogen could be made from renewable energy, and I believe can enhance the nation's economy and energy security. AC Transit has been actively using zero-emission technology since 2003 and its bringing us one-step closer to our ultimate vision of a full fleet of hydrogen zero-emission fuel cell-powered buses. Our Fuel Cell (FC) fleet performs the same tasks as our ultra-low emission diesel fleet, but without the hydrocarbons, nitrogen oxides, carbon monoxide and particulate matter from exhaust. That is why I think the name should be changed to “Forever Clean!” For nearly two decades, our FC fleet has fostered a healthy environment by using hydrogen, in a chemical process to produce electricity, that runs the electric motor; and it’s only by-product is H2O (water). Our fuel cell fleet will decrease our carbon footprint; reduce noise and potentially healthier lives for those in the communities we serve. As a Maintenance Superintendent and a 34-year veteran of AC Transit, I thought I knew everything about an internal combustion engines. Then came the fuel cell bus and it blew my mind! Each fuel cell engine is quiet, clean burning and three-times more efficient than traditional combustion engines. I am proud to be a part of a transit agency that is on the cutting edge of this transformative technology. It is exceedingly important that any alternative to traditional fossil fuels not only be proven effective, in terms of performance, but that it can be viable over an extended period. I am proud to be part of a team that has demonstrated hydrogen fuel cell technology can, when properly maintained, exceed the expectations of the manufacturer. The future is bright for alternative fuels, and our maintenance team is excited to do our part; keeping these systems operating to their fullest potential. I have lost count of the number of bus models, changes to engine configurations and transmissions in my 27 years with AC Transit’s Maintenance Team. But when the first-generation fuel cell coaches were received, my outstanding memory was “game changer.” This new fuel cell technology was a quantum leap into the future. Now, with over 312 thousands hours and 2 million miles operated, we have proven in real-time that a transit agency can leave fossil fuels behind. Without question, I am honored to be a part of this pioneering team. I have witnessed an evolution in my nearly 30 years with AC Transit. From a fleet without power steering or air conditioning, to AC Transit’s evolution from diesel exhaust fluid (DEF) to water as exhaust with hydrogen technology. Now, after working in this innovative environment, I liken transit agencies without zero-emission technology to still using a rotary phone in an age of cellular devices. We are learning more every day, but what is clear is that Fuel Cell advancements are making our world a cleaner healthier place.